Nikon launched the EM in 1979 as the first in a series of three low budget compact bodies, later additions being the Nikon FG and Nikon FG-20. The camera was designed to appeal to women. Compared to contemporary Nikon cameras, the EM contained a high level of plastic, although it's based on a pretty solid metal internal structure. The EM was an automatic camera with aperture control. To allow for a higher degree of control, an exposure compensation button was added to the front upper right. This lowered the shutter speed by two steps, to ensure the correct exposure of backlit subjects. Two mechanical speeds were available in case the battery failed: 1/90 sec (x-sync speed) and Bulb (for long exposures). Together with the EM camera, Nikon launched a set of 8 small, light weight and more affordable lenses. To distinguish from the more professional 'Nikkor' lenses, they were called 'Series E'. 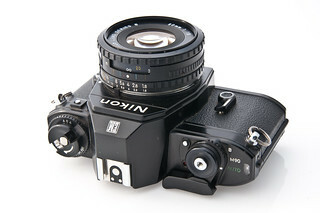 However, they feature the same F-mount bayonet and can be used on all AI-spec Nikon cameras. The original version lenses lacked a metal lens mounting ring and had a more rudimentary finish to the focusing and aperture ring. Besides dedicated lenses, cases and an eyepiece adapter, a dedicated flashlight and MD-E motor drive (2 fps) were offered. 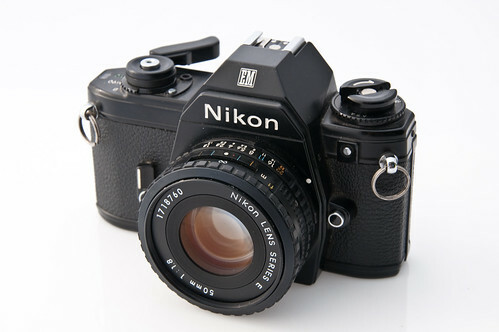 ↑ Nikon's Camera Chronicle - Part 11: Nikon EM states: "The Nikon EM (Photo) was developed as a small, cute, easy-to-use "SLR Camera for Women", appealing to a market whose needs were not being met sufficiently by conventional heavy, "uncute" SLR cameras on the market at the time". My Nikon EM Cameras by Sheldon Brown. This page was last edited on 15 January 2018, at 06:16.